OAKLAND, Calif.—For the seventh year in a row, poets, artists, musicians, writers, and playwrights from around the globe have joined together in 100,000 Poets for Change – events of many types, all celebrating artists who are working for a sustainable and peaceful world. Many, but not all, take place on the last weekend in September, and many are shared around the world via livestreaming and video. 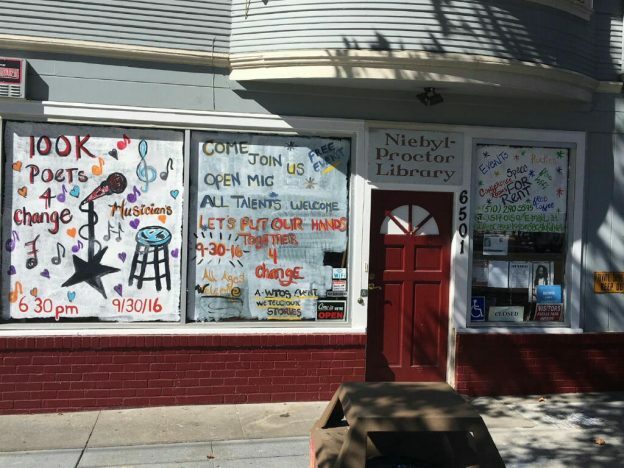 One of several such events in the San Francisco Bay area took place on Sept. 29, at the Niebyl-Proctor Marxist Library. 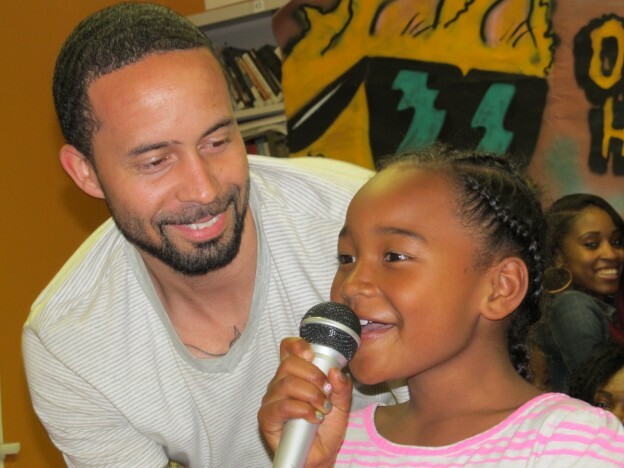 Highlighting the program were area poets, singers, instrumentalists, and artists who shared their visions of a better world with community members. Poet Roxanne Jones followed with a heartfelt tribute to the library as “Mama Cassie and Papa Cassie’s village of international history, culture, and library of love,” and invited all present to share in an abundant potluck feast put together by many community members. 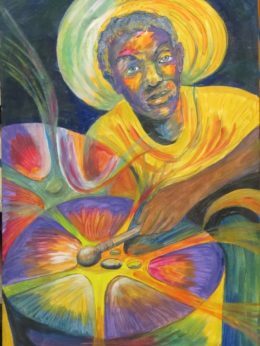 Contributing to the celebration and its rededication to positive change were musicians including well-known area Gospel singer Leonard Smyer, a women’s choir of University of California students brought together by Akberet Hagos, and renowned Caribbean percussionist Val Serrant. Poet Das Saswati protested the soaring inequality experienced by people today, and the ravishing of the earth itself, while Lupe Copendah’s ode to Prince was a tribute to the late artist’s lasting legacy and the sorrow his audiences experienced with his untimely death. Cassandra López, herself a retired high school teacher, emphasized teachers’ roles in preparing students for life in far more ways than just academic pursuits, and gave a special tribute to teachers and former teachers in the audience, including artist Eldica Miller – several of whose works were displayed in the hall, and poet Kharyshi Wiginton. This entry was posted in Uncategorized on October 13, 2017 by Michelle Kern. Come and join us in a worldwide expression of creativity, solidarity, and joy. Suggested donation of $5 to cover refreshments. This entry was posted in Uncategorized on September 16, 2017 by Michelle Kern. This entry was posted in Uncategorized on August 1, 2017 by Michelle Kern. This entry was posted in Uncategorized on June 6, 2017 by Michelle Kern. 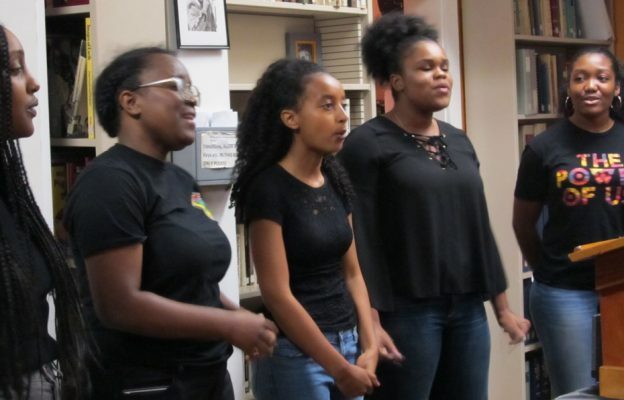 OAKLAND, Calif. – Poetry, music and film came together Sept. 30 as artists and community gathered at the Niebyl-Proctor Marxist Library to join in 100,000 Poets for Change, a celebration of artists around the world who are working for peace, economic and social justice. The celebration was one of many in the San Francisco Bay Area, with hundreds more held in many countries during late September. The program featured celebrated Caribbean percussionist and singer Val Serrant, who opened the program and performed several times during the evening. Serrant was joined by area poets, whose works dramatize the issues facing working and poor people today. Film held a central place in the program. The evening’s MC, Cassandra Lόpez, “Mama Cassie” to the community, introduced the collective producing the film work-in-progress, “We Tell Our Stories: This Side of Oakland,” led by writer and activist Lyndsey Ellis. A short clip featured Layloni Marshall, a young single mother of three, who, with help from the community, was recently able to graduate from San Francisco State University with a Bachelor’s Degree in Sociology. Also featured was a short clip from Alsenosi Adam’s film, Losing Oakland, an award-winning exploration of gentrification Adam made while a journalism grad student at UC Berkeley. The film also highlights the new people – largely white and younger – who are moving into Oakland as housing costs soar around the region, and who see the city as a good place to settle and build a new life. The evening ended with the audience viewing a video, Why We Vote, prepared by a group of young people as a call for audience members to not only vote themselves, but to make sure family and friends are registered and go to the polls on Nov. 8. This entry was posted in Uncategorized on October 10, 2016 by Michelle Kern. This entry was posted in Uncategorized on June 9, 2016 by Michelle Kern. OAKLAND, Calif. – The life of the longest-surviving member of the Abraham Lincoln Brigade – the 2,800 Americans who helped fight the emerging fascist forces in the Spanish Civil War of the late 1930s – was celebrated May 21 by friends and family from around northern California. The celebration of Del Berg’s life was held at the Niebyl-Proctor Marxist Library, and was co-sponsored by the library, peoplesworld.org, the Northern California Communist Party, and Veterans for Peace. Esley Delmer Daniel Berg – known to all as Del – was over 100 years old at the time of his death on Feb. 28, 2016. A lifelong political activist and leader, Del grew up in a poor farm worker family. In his early 20s, alarmed by the rise of fascist forces in Europe, he joined the Americans who traveled to Spain as part of the 40,000-strong International Brigades, to help Spanish anti-fascist fighters in their struggle against soon-to-be dictator Francisco Franco and his German and Italian fascist backers. Though their mission ultimately failed, the “Lincolns” – sometimes called “premature anti-fascists” – have been celebrated ever since for their courage and dedication. Some 800 of the Lincolns died in Spain, and many of the survivors became among the most distinguished fighters in the U.S. military in World War II. Returning to California in 1939, Berg later served with the U.S. Army in the Pacific before returning to life as a farm worker. Del Berg’s multifaceted life – always fully engaged in people’s struggles for economic and social justice – inspired the speakers at his memorial celebration. Among the many organizations he joined or supported was the Communist Party USA, which he joined in 1943, after returning from Army service. Northern California Communist Party chair Juan Lόpez said Berg “served with distinction” for years, as a member of the leadership collective, making the grueling trip to the Bay Area from his home in the Sierra foothills despite his age. Nadya Williams, who MC’d the program, also cited Berg’s active membership in a broad spectrum of peace and social justice organizations, including Veterans for Peace, the United Farm Workers, the Mexican American Political Association, the California Democratic Party, the California Alliance of Retired Americans, and the NAACP, where he was elected vice president of his local chapter. Berg was also active in the anti-Vietnam War and anti-nuclear weapons movements, and women’s rights struggles as well. John Veen, who traveled with his wife, Vickie, from their home in Fresno, Calif., told how Berg reached out from his Sierra foothills home to people in different parts of the Central Valley. “He was always talking about the need to bring together the Mexican American community, the African American community and the labor movement in general,” Veen said. “Another thing about Del – he danced!” Veen told the crowd. “Raise your hand if you’d be surprised to know there was a dance club, and Del was elected president!” No hands were raised. When the mic was opened to friends in attendance, several told how Del Berg would always maintain that he wasn’t a “learned” person, and was very modest about his knowledge. But they emphasized the depth and clarity of his thinking, and his broad and thoughtful approach to every issue. Berg also maintained an extensive correspondence with activists in the U.S. and internationally – all handwritten in an extremely neat script since he didn’t use a typewriter. A full afternoon of tributes and memories included a video of Del Berg’s life, put together by People’s World social media editor Chauncey Robinson, and remarks by friends including PW writer Henry Millstein, who interviewed Berg in 2014, University of California at Chico Professor Char Prieto, who read the poem she wrote for Berg’s 100th birthday, and others. This entry was posted in Uncategorized on May 27, 2016 by Michelle Kern. 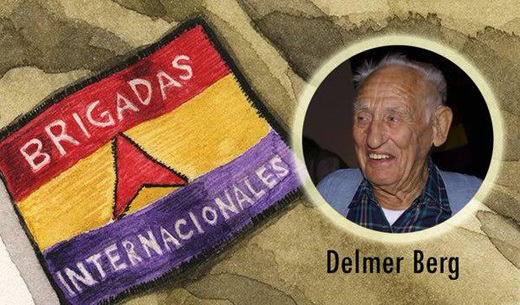 Last Known Member of the Abraham Lincoln Brigade – who died February 28th, 2016 at the activist age of 100. Speakers, Video, Photos, Food, Memories, Good Company, etc. *please try to invite NEW people who might not know about: the Spanish Civil War (1936-39), the 40,000 members of the International Brigades, or the nearly 3,000 Americans who fought in the Lincoln Brigade. This entry was posted in Uncategorized on May 7, 2016 by Michelle Kern. 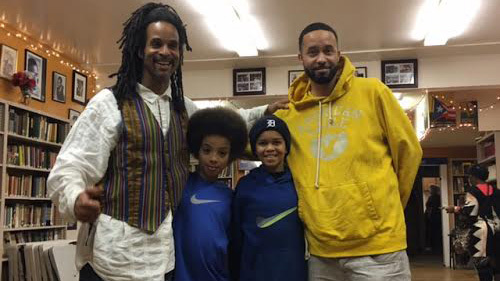 OAKLAND, CA — The rains poured down on us and the winds howled as we made our way to the Niebyl-Proctor Community Library last Saturday to honor our history. This year’s celebration would be a roundtable discussion of the presidential election and its significance to our future as a people. Like most events, the organizers watched nervously through the windows to see who may be joining us. In the kitchen, chickens were frying, corn soup was heating up and barbequed organic sausages were simmering in the oven. Oh my Lord, we sure like to cook! Tables were set with our traditional red, black and green colors. Soulful rhythms filled the air and for that moment all was right with the world. A few people arrived and then the door blew open wide! Like a gust of wind, young people entered with their children and babies in tow. Quite magically in an instant we had the roundtable fully assembled. The first hour was spent eating and socializing. Then it was time to begin the discussion. Everyone, including children ranging in ages from 11 months to 19, remained at the table. I supposed some of us thought the children might not stay put, but they did. Amazingly the young children’s hands went up first. Lil Antoine – nine years of age – blurted out, “Hillary…because my grandpa likes her and he says she’s the best and I believe my grandpa.” Then he gave the two thumbs up. From that point on the discussion got a little heated. Sistah Fischer, a retired educator, and Shannon, a student of Chinese medicine, both spoke passionately about the need for more resources in the black community. The need for good paying union jobs and great schools to prepare our next generation were highlighted. Racial discrimination in hiring also came to the forefront. “Even when more jobs are created, we – black folks – are last to be hired, if hired at all,” I said vehemently. There was consensus among most in attendance that having Bernie or Hillary become president is our best shot. At the end of the roundtable discussion, Lil Antoine helped bring the meeting to a close by asking people to give a thumb vote for their favorite candidate. Thumbs up for Hillary, thumbs to the side for Bernie and thumbs down against Trump. The vote was pretty much split, but for Trump it was all thumbs down! This entry was posted in Uncategorized on March 13, 2016 by Michelle Kern. Thanks to your continuing generosity, 2015 has been a year of new achievements for the Niebyl-Proctor Marxist Library. Now we need your help again, to continue NPML’s progress. NPML continues to be an important venue for organizations promoting critical thinking on crucial issues, including expanding democracy, overcoming economic and social inequality, combating climate change, supporting diplomatic approaches to international crises, and fighting all forms of discrimination. The library’s collection of important books and papers is being re-catalogued, with holdings to be listed online. And, NPML’s importance as a cultural center continues to grow, with dance and musical groups finding the library a great place for their activities. NPML hosts We Tell Our Stories, a grassroots film collective preparing a documentary about the intersection of ordinary people and community activism. We co-sponsor annual celebrations of African American History, and participate in 100,000 Poets for Change, a worldwide movement of poets and other artists. New this year: open-houses at Thanksgiving and Christmas, to help homeless Oaklanders with food and clothing. If you’ve been by 6501 Telegraph Ave. lately, you’re seeing a physical transformation to match the growing programs, with the interior newly painted and decorated, new projector and sound equipment, and some much needed repairs. In case you haven’t had a chance to see the changes, here are some photos for you to enjoy. All this is possible because you and others like you have been very generous. Your continuing donations are very important to our continued progress – and, they are tax deductible! Please make, or resume, your monthly pledge to NPML. Or send us a one-time donation at the address above. All of us at NPML extend warm season’s greetings, and heartfelt appreciation for your support! This entry was posted in Uncategorized on December 29, 2015 by Dylan Ryall.